The SMSC Organics Recycling Facility is one of the largest composting operations in the state of Minnesota. Many nearby communities, grocery stores, restaurants, and school districts sustainably dispose of their organic waste at our facility. We take what might have been tossed in a landfill and instead create high-quality compost, compost blends, and mulch. Many of us have used compost in our gardens and yards, but have you ever wondered about the science behind what compost actually is and how it’s made? Today, we’d like to share with you a little bit of information about how the composting process happens, and how the Shakopee Mdewakanton Sioux Community (SMSC) is able to take waste material and recycle it into a valuable product. Let’s start by defining what compost is. Compost is organic material that decomposes into a rich soil amendment. Anything organic can be put into a compost pile to decompose. This includes items like fruits, vegetables, meat, dairy, fur, hair, bones, paper, napkins, leaves, grass, and brush, to name just a few examples. If it was once living, it’s compostable. In order to become compost, these items must be mixed together according to a specific “compost recipe.” A compost recipe consists of four main components: carbon, nitrogen, water, and oxygen. At the SMSC Organics Recycling Facility, we use wood and yard waste as our carbon source and food waste as our nitrogen source. All organic material contains both carbon and nitrogen, but some materials have a higher carbon content, and some have a higher nitrogen content. Compost recipes are created on-site according to a carbon to nitrogen (C:N) ratio. In large-scale composting, C:N ratios range between 25:1 to 30:1 (i.e., 25-30 parts carbon to every 1 part nitrogen). Water content and oxygen content are also important parts of a compost recipe. 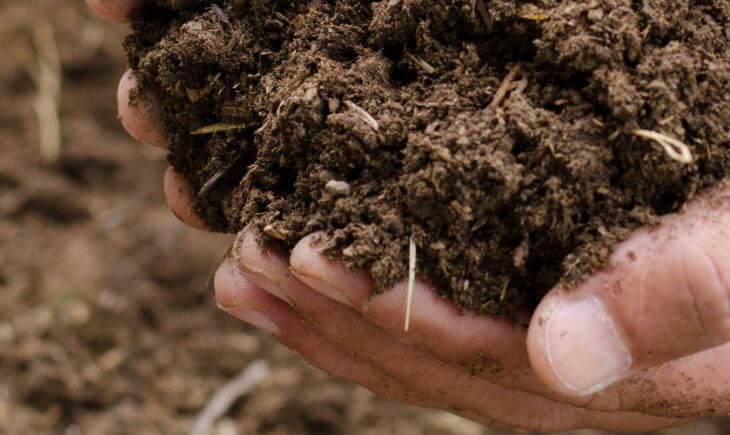 While creating and maintaining compost piles, we aim for a moisture content of 50-60%. This ensures that there is a favorable habitat for good bacteria to survive. Oxygen content in a compost pile should be about 8-18%. To ensure adequate oxygen, compost operators add larger pieces of wood to the compost recipes, which provides air spaces and reduces compaction in the piles. Once the material is mixed together in the correct proportions, biological processes take over. Microorganisms present in the incoming material will multiply and break down organic material into a soil-like material called compost. Microbes will consume feedstocks to obtain energy and nutrients, generating heat in the process. The heat is then retained within the pile and supports further decomposition. Compost piles generally stay between 131–160 degrees F during the active composting period. About 80-90% of the microorganisms in a compost pile are bacteria. Bacteria is responsible for most of the decomposition and heat generation in a compost pile. Another common microorganism is fungi. Fungi is able to break down the tougher organic debris, such as cellulose. Fungi is not active during the high-heat active composting phase; it is instead most active during the curing phase, when compost temperatures drop and allow fungi to thrive. Also present in a compost pile are actinomycetes. These microorganisms are filamentous bacteria that form long chains that can be seen with the naked eye. If you dig into a compost pile, you will see these grey spider web-like bacteria. Actinomycetes also give compost its “earthy” smell. This decomposition process occurs in nature, but the SMSC Organics Recycling Facility is able to speed up the process to achieve faster decomposition. In a large-scale operation, the active composting period takes about 70-90 days. Temperature, oxygen, and moisture readings are taken frequently during this period and are used to guide management decisions. Windrows (long rows of piled compost) can be turned, watered, or have material added in to keep them in the ideal composting zone. During the active composting period, windrows must meet a requirement called PFRP, or Process to Further Reduce Pathogens. This rule requires compost to stay above 131 degrees F for at least 15 consecutive days. This ensures that any pathogens or weed seeds in the compost will be killed, and that our end product will be safe for use. PFRP also requires turning the compost at least five times over its lifetime. Turning mixes the compost and stimulates microbial activity, promoting further breakdown of the materials. Once the active composting period has finished, the compost moves into the curing phase. During curing, compost naturally cools, and the decomposition process slows down. This is when fungi will begin to take over. Compost will remain in the curing phase for 2-3 months. Compost is considered “done” when the original materials are unrecognizable, it is dark in color, has a pleasant earthy smell, and the pile is roughly 1/3 of its original size. Staff at the SMSC Organics Recycling Facility also use test kits on-site that indicate maturity. Overall, the composting process at a large-scale facility takes about 5-6 months from start to finish. What results is a rich soil amendment that will help you create flourishing gardens and healthy landscapes wherever you sprinkle it.